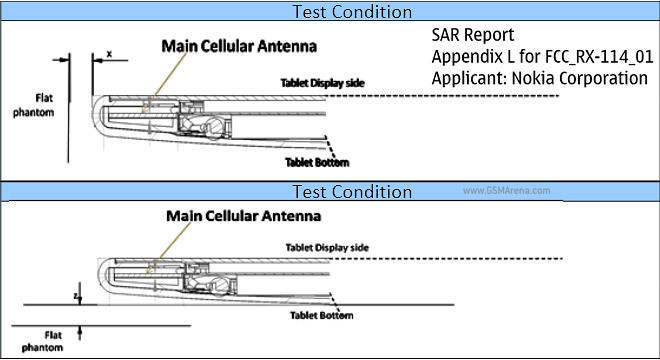 The FCC documents are pretty scarce in terms of imagery (the interesting bit is the image above) but they do give out cell connectivity info. According to the report, the Nokia Lumia 2520 tablet should work on GSM/HSPA+ on AT&T and T-Mobile and LTE on these two carriers and even Verizon. Knowing Nokia’s penchant for releasing a high-end device exclusively on a single carrier, we might see the 2520 on only one of those (AT&T if history is any indication). There are 6 new devices on the way at the October 22 Abu Dhabi event with at least two new Lumia devices. One of them is expected to be a phablet – Lumia 1520 – and the other might be this tablet, the Lumia 2520.